James Oakley has been providing entertainment services to a diverse range of clients for more than 15 years. James studied English and Theatre at The University of Glasgow and has lived and worked in Glasgow since 2000. Most nights of the week James can be found a holding court in the Pubs of Glasgow as socially aware Pub Quizmaster 'Sir James' Lord of the Quiz. As well as his Pub Quizmaster responsibilities, James offers numerous entertainment possibilities - check out this site for ideas and examples of James's past work. 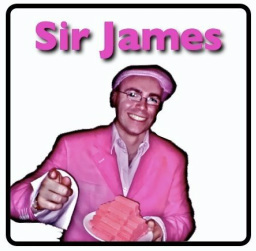 Entertainment persona Sir James with distinctive Pink Jacket and plate of Pink Wafers.